Godt å se at årets julebrusavstemning er i gang! Etter et hårfint nederlag i fjor er vi klare til å ta opp kampen og knuse sølevannet fra Hamar og Lillehammer. Nice to see that this years julebruspoll is up. After a narrow loss last year, we are ready to go to battle and crush the mud water from Hamar and Lillehammer. As I said, some people can be fiercly patriotic, but not that many people. If you have read this quote, you have read almost 10% of all content in the forums of julebrus.org. Still, julebrus is quite a local thing, and I think a lot of people could at least be said to be mildly patriotic of their julebrus. There is also the matter of the colour. Julebrus comes mainly in two colours: red and yellow/brown. 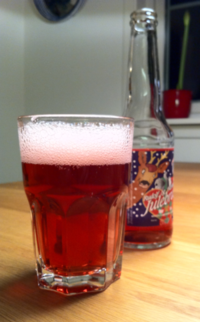 The red ones usually taste quite similar to a fizzy drink previously known as "bringebærbrus" (raspberry fizzy drink), but now known as "brus med bringebærsmak" (fizzy drink with raspberry taste), after they had to change the name because it didn't actually contain any traces of raspberry. The yellow/brown julebrus is usually has what is known in fizzy-drink context as "champagnesmak" (champagne taste), which of course doesn't taste anything at all like champagne. In 2007, aperitif.no conducted a fairly serious test of 20 different brands of julebrus. The winner was Lerums Julebrus, from Sogndal, a municipality with a population of about 3000, next to a fjord on the west coast of Norway. I don't know if they still make it, and if I can get it in my city, but if so, I'll try it and report on my findings. Not quite as much as Karoline likes julebrus, but there are limits for sane people. Pardon me? Du veit i har kontroll på julegavan i det huset her.. Just saying.